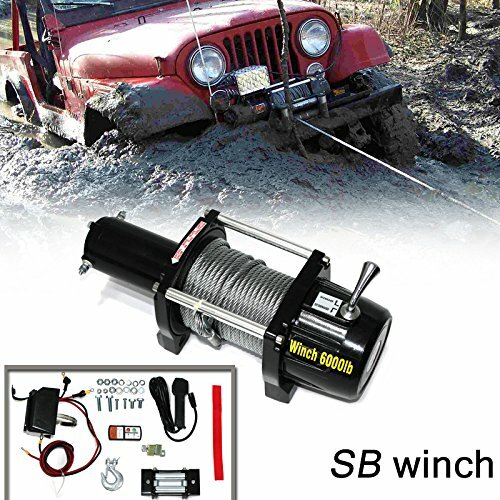 This New Electric 12V 6000lb Winch Will Work On Most Vehicles,But Please To Ensure Your Vehicle Gross Weight Should Not Be Over 9000lb. 1. Off-Road Vehicles: Pickup Truck,4WD,ATV,JEEP,SUV,UTV,Van,Fork Lift,Train,Boat,Bus,Tank,RV,Trailer,etc. 2. Specialized Vehicles: Communication Vehicle,Fire Engine,Police Cars,Rescue Vehicle,etc. * Brand New Premium Quality Products. * High Power Motor Drive,The Power Is Strong And Steady. * All Metal Gearing for Durable Dependability. * Durable,Smooth,And Reliable Three-Stage Planetary Geartrain. * Ip67 Waterproof & Anti-Sediment. * Exclusive Brake Design for Superior Winching Control. * Sensitivity Of Remote Control. * 4-Way Roller Fairlead To Guide The Rope Onto The Drum Evenly. * Great Looking And Long Lifetime. * Honeycomb Paper Packaging,Super Protection. * Before The First Use,You Should Re-Twine The Winch Line. First,Release The Winch Line Until 4 Complete Turns Of Cable Around The Winch Drum,Than Recover The Winch Under The Load. * Don't Exceed Winch Load Weight Capacity. * Don't operate and spool under full load over one minute continuously * Never Fully Extend Cable While Under Load. Keep 4 Complete Turns Of Cable Around The Winch Drum. * While Motor Is Over Heating, Please Stop for A While To Cool Down. If you have any questions about this product by VioletLisa, contact us by completing and submitting the form below. If you are looking for a specif part number, please include it with your message.